Ironically in the week a Spanish court revisited the saga of the 2002 Prestige sinking, European shipowners endorsed yesterday the adoption of EU operational guidelines on places of refuge for ships in distress at sea, which were produced by the Cooperation Group on Places of Refuge, bringing together member states, the European Commission and industry. 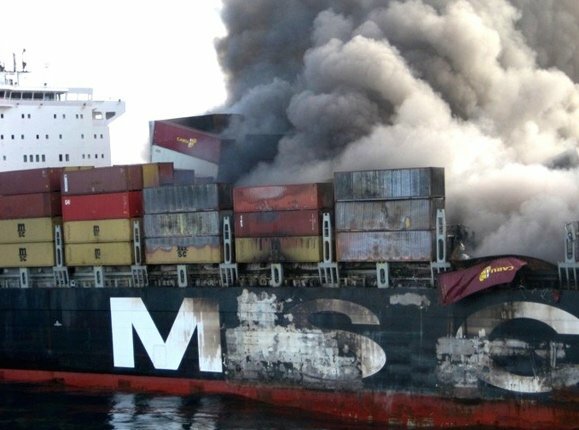 Work on these guidelines started following the MSC Flaminia incident (pictured) when a fire broke out onboard a German-flagged vessel, which was subsequently left adrift on the high seas for weeks until Germany agreed to allow the stricken ship to enter its territorial waters. The incident demonstrated that, despite the provisions laid down in Directive 2009/17/EC amending Directive 2002/59/EC establishing a Community Vessel Traffic Monitoring and Information System (VTMIS), there was no uniform application of this directive. The incident also evidenced the need to enhance cooperation between member states when confronted with a ship in need of assistance. The adopted operational guidelines aim at providing practical guidance for the different parties involved in the process of dealing with a ship in need of assistance so as to support a more uniform application of the provisions of the VTMIS Directive. They also aim at enhancing cooperation amongst all parties involved. They do not, however, replace any legal obligations laid down in applicable legislation and they do not supersede, but rather complement the guidelines developed at the IMO. Earlier this week a Spanish judge sentenced the captain of the Prestige tanker, arguably the most famous incident of ship in need of a place of a refuge, to two years in jail.